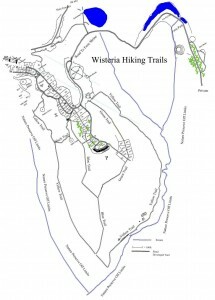 Wisteria offers many campground facilities and services. Here are a few that may be available at events. Please note, hours listed are typical, and may vary by event. The Gate House (Eco-Hut) is typically open 24 hours a day. Registration is available only from 9:00 am through 11:00 pm Thursday through Sunday of an event. During open camping weekends, you may be asked to register at The Market. The Market trailer is painted green and purple and located adjacent to Caffeina’s Coffee House. The Market offers camping, personal supplies, and local artists goods, as well as general information. The First Aid station is located in the same trailer as the Market, next to Caffeina’s Coffee House. In the event of a medical emergency, if you are not near first Aid, summon help immediately from any Wisteria Staff person with a radio. In case of injury, report to First Aid where you can receive basic first aid treatment or be routed to a local hospital. Do not attempt to move an incapacitated person unless s/he is in immediate physical danger. There is always a radio at First Aid. If no one is immediately available, use the FRS radio on Wisteria Channel 3 to contact patrolling Wisteria Security/First Aid staff. Our in-house coffee shop features local muffins, cookies, cakes and many more treats depending on the season. We have your backwoods drink needs covered! We offer Pepsi products, La Croix sodas, Gatorade, iced tea, Red Bull and of course COFFEE! We use locally roasted, organic, fair trade certified Silverbridge coffee, and offer a light roast, dark roast and Jamaican Me Crazy flavored blend. We have local Snowville Creamery 2% milk and half and half, and if you prefer, we can fancy it up with flavoring and whipped cream. That’s right, we have your iced mochas covered on those hot festival days. Hours vary depending on the festival. Enjoy live musical performances on Caffeina’s Stage while you nourish your body and soul. There’s no need to rough it when it comes to food. With our multi-generational love affair of working with food we delight in feeding the people. We make all our food home-style and try to add as many local/organic ingredients as we can. Dinners include a generous helping of sides as well as the entree. Compare our moderately priced meals, for healthy food, to the high cost of fast food. You will appreciate our home-style alternatives, served with a smile, in the beautiful fields of Wisteria. Many guests eat with us to save the time and cost of preparing and storing food at their encampment. Alternatively, you may want to eat some meals at your campsite, and some with friends at Caffeina’s, or just grab it on your way to your favorite workshop. The choice is yours, we’ll have the food hot and ready. We stock our cooler with an extensive variety of food options for both herbivore and omnivore. We will serve up a hot fresh breakfast every morning, hot lunch every afternoon and each night, we will have we will have an ever changing selection of homemade dinner entrees available for both omnivore and herbivore. We strive to do our part in being green and use all recyclable “to go” containers and utensils, and reusable plates and silverware. Don’t have time to sit down for a meal? Grab a pre-made meal from the cooler when you are on the go. Look for our popular Plowman’s Meal, it will stoke you for the day. For your convenience we offer our popular tab program: set up an account at the beginning of the week using a credit card, we’ll keep a tab for you with no need to remember your wallet. We will run it at the end of the week before you leave. Kids’ Village playground is open from 11:45am to 4:45pm with supervised activities on Friday and Saturday and Sunday. This timeframe is to permit parents/guardians to drop off children and still get to workshops on time. Parents please drop off and pick up your children at the playground during the time specified in order to respect Village staff volunteers. Our natural swimming pond is open from 10:00am to 6:00 pm daily, weather permitting. Do NOT enter the pond area after it is closed. No lifeguard is on duty; swim at your own risk and obey all posted rules and regulations. Our parking lot is located on the right branch of the tee coming down the hill, past Pirate’s Cove. If you wish to park your car at your campsite or camp out of your car, you may purchase a $10 parking pass good for the entire event. Once your car is parked, it MUST STAY PARKED (violation will result in your parking pass being revoked without refund, and your car will be moved to parking). Please prevent damage to our roads and land by avoiding unnecessary driving. There are blue portable toilets located throughout the campground for your convenience. A disability-accessible portable toilet is available next to First-Aid. Please close the lid completely when finished to allow the convective process to function properly and keep the interior stink-free. If the toilet paper runs out please let a staff member know, and we will restock them promptly. Portable toilets are pumped every morning. Wisteria Security is on site and doing rounds during all events. Our security team is friendly and willing to help in any situation needed. Please don’t hesitate to ask. During the larger festivals, we will be running golf cart shuttles through the campground for your convenience. If you enjoy this service, please help us keep it going, with a suggested donation of $.50 – $1.00 per ride. Please do not let your children joyride, as there is limited seating available. We have trash and no-sort recycling service available throughout the campground in designated trash and recycling bins. We also run a trash and recycling trailer at about 4pm every day. Bring your trash or recycling curbside when we pass by and we’ll pick it up. Recyclables accepted include paper, type 1 and 2 plastic bottles (no lids,) cardboard cartons, steel, tin and aluminum cans, and all colors of glass bottles! Keep the scene clean, and don’t let your trash pile up! Compost is plant-based organic matter that is not trash or human waste/sewage. Compost buckets are located next to wastewater stations. Pour organic liquid waste (not sewage) into the wastewater stations located throughout the campground. Enjoy a walk on the campground loop trails. 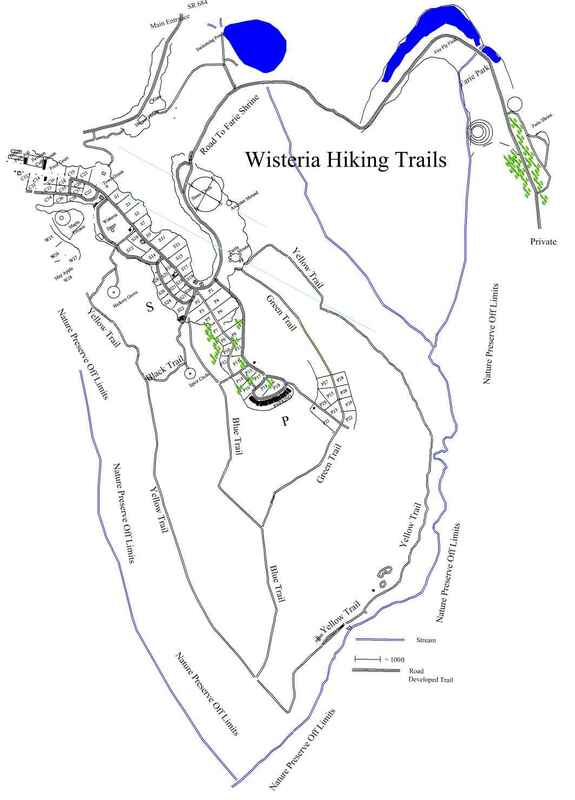 Maps are available at the Wisteria office. The Yellow Trail has identification signs for Appalachian trees, plants and woodland herbs. Please respect the creatures that live here year round. There are potable water spigots located throughout the campground. Please do not do your dishes there, we do not allow soap to run on the ground. Please use the green spigot handles, not the large blue hydrant handles, to obtain water; the large blue hydrant handles will be taped or locked closed during events. You may attach a hose only temporarily, and only through a tee and vacuum breaker. RV / Camper hookups are not permitted. Firewood is available between the Market and Caffeina’s for $10.00 per level cartload. Ice is $2.50 per 8lb bag. Pay at Wisteria Market or at Caffeina’s Coffee House. Carts available to haul wood. Please return promptly.